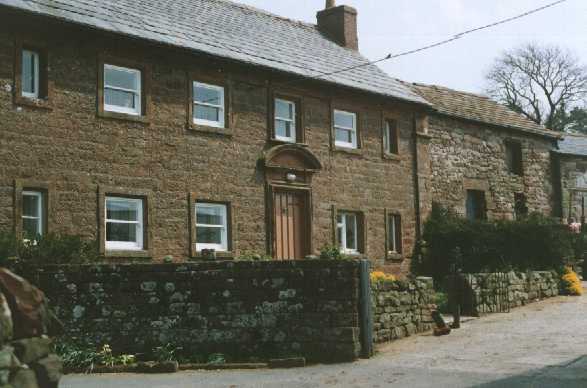 Scarrowmanwick Farm where John spent his childhood. John Robley, son of Thomas Robley and Elizabeth Dixon, was born in 1799 In Castle Sowerby. Elizabeth and Thomas had 6 other sons and 3 daughters. His brother Joseph's life is also in the "Short Biographies". He was baptised on 23 October, 1799 in Castle Sowerby, Cumberland. ( John, son of Thomas Robley of Sowerby Row Farm & Elizabeth, his wife late Dixon). "Robley emigrated to America several years after this date." From the chapter on Melmerby Rounds. Although it has not been possible to procure a passenger list, it seems likely that John and his brother William were on the ship the Mary Ann, which sailed out of Whitehaven in 1822. It took 52 days to reach the port of Pictou, and there were 39 English passengers on board. Thomas Robley, born 11th February, 1831. Thomas later settled in California. James Robley, born 13 August, 1836. He is thought to have settled in California. Elizabeth Robley born 29 March, 1838. Married Walter Matheson of Pictou County. Recorded on the 1881 census at Takamagouche, Colchester, Nova Scotia. Walter is described as a miller, & there are 8 children. Lived in Washington State & California. Margaret Robley, born abt. 1841. Nancy Robley, born 9th April 1844. Married to C.J. Maguire of Halifax, NS. Hannah Robley, born abt. 1847.She married Peter Ross Meikle (1843-1919) on 2nd December 1875 at Stellarton, Pictou, Nova Scotia. 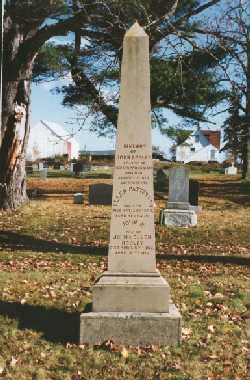 Hannah was 28 and Peter was 32.She died on 10 November 1877 at New Glasgow, Pictou, Nova Scotia. On the 1881 census for New Glasgow Peter R. Meikle, a widower, aged 37 and a merchant, is living with a child Ella M. Meikle, aged 4. Did Hannah die in childbirth? Isaac Robley, born 28th February, 1849. He married Catherine Jane McKenzie (1861-13th Oct. 1905). Isaac died on 10th October 1923. John W. Robley. born 1852. Died April 5th 1857 aged 5 years. (see tombstone below). Ellen (Helen) Robley born abt. 1855. She married Peter R. Meikle, a widower aged 37, on May 12th 1881. Ellen was 28 and Peter 37. Peter is described as a merchant. The presumption is that when Hannah died her sister, Ellen married the same man. Peter and Ellen are thought to have moved to Oakland, California. Catherine L. Robley, born abt. 1862. She married Robert MacLean of West River, Pictou County, Nova Scotia. Catherine was 24 and Robert 25. Robert was a carpenter. 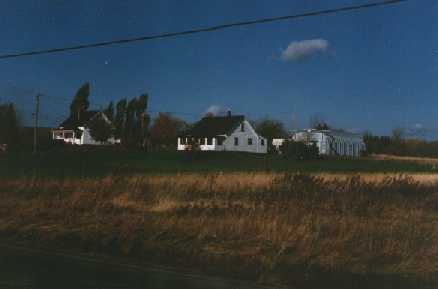 Centre: the old John Robley Homestead, Lyons Brook, Pictou County, Nova Scotia. John continued to work as a farmer in his ancestral tradition. Lyons Brook is just a few miles out of Pictou town. 1871 CENSUS, PICTOU COUNTY, NOVA SCOTIA. John died on 1st January 1876. 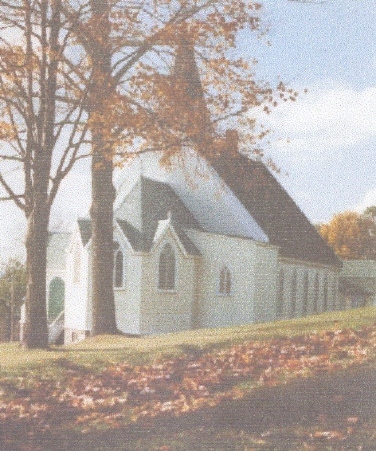 He was buried in St. James Anglican Church, Pictou, Nova Scotia. The present-day Robleys in Pictou, NS. are descended from John's son Isaac, who married Catherine Jane McKenzie on 2nd February, 1884. Isaac & Catherine moved to Roger's Hill, Durham, NS and had 7 children. Research by Beverly Campbell & Marian Foster. Canadian photographs from the collection of Beverly Campbell.